This is my first blog post, so let me get started by introducing my tower. I built this tower from square, steel tubing, anchored in steel reinforced concrete. I installed my solar water heating panel and my photovoltaics on the top of the tower, which is oriented to face due south. The green box holds batteries, a charge controller, and some other electronics for monitoring and controlling the power generation part of the system. There is also a pressure tank for the rain water pumping system in that box. Mounted below the green box is a 275 gallon water tank that holds rain water that is funneled into it from the gutters on the house. 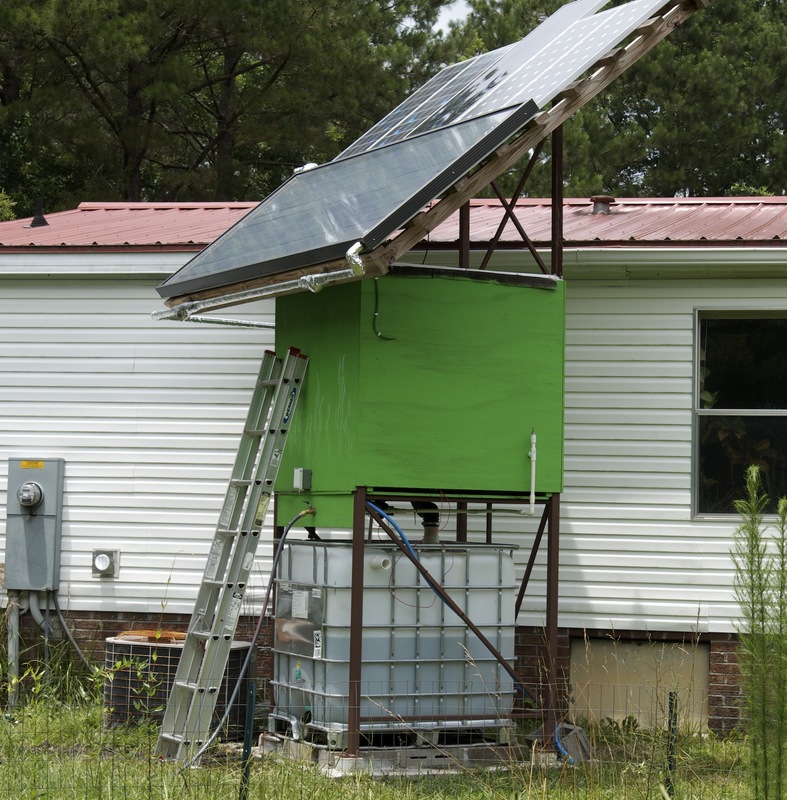 There is a 12 volt, solar powered pump and some plumbing that connect to a couple of spigots where I can connect garden hoses and an outdoor shower for rinsing off after a hard day, working in the sun. My photovoltaics charge batteries that power some 12 volt equipment in my house and an inverter that provides 110V AC for powering tools, my electric lawn mower, and other things. The batteries also power my water pump, as previously mentioned. I’ve always got several projects in the works, and I hope to use this blog to document my progress on those projects.